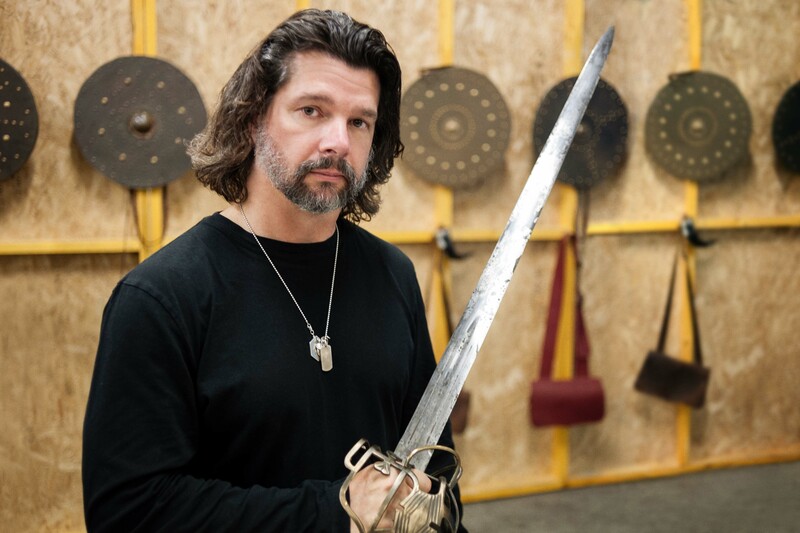 I had the pleasure of speaking with Ronald D. Moore, executive producer/showrunner of Outlander, in a roundtable setting while at San Diego Comic Con. The conversation with my fellow journalists began with joking about the place card they brought along with them to each table to identify who they were. Ron wondered what would happen if he switched his name with Diana Gabaldon, Sam Heughan, or Caitriona Balfe. For the Outlander interviews, I represented both The MacGuffin and Outlander TV News. Outlander Podcast: With so much of Jacobite history being intertwined with religion, was it a conscious decision to downplay Jamie’s (Sam Heughan) faith versus Claire’s (Caitriona Balfe) nominal Catholicism and the deep devotion of the Scottish people? Ron: No, it wasn’t a conscious decision. I think it was just a question of emphasis. We didn’t try to play it down. I guess it just didn’t quite play into the story as much. In the dialog, it just didn’t write to it. We could have. It wasn’t really a strategic choice or even a creative choice. It just sort of evolved that way. Q: With the timeline changing in book 2 (Dragonfly in Amber), how difficult was it for you to adapt that and make sure that fans that have not read the books understand what is going on? Ron: It’s a big challenge. The second book is much more complex. It’s a more difficult book to adapt. As a result, it shifts point of view, it plays with time, it’s more political. It is dealing with the Jacobite rebellion. Most people in this country (U.S.A.) have never even heard of, so it is a challenge. We are always trying to play this to two audiences, the book fans and then the general audience who has no idea, and you have to play fair with both. The fans are looking forward to certain things and you want to satisfy that and you also want to surprise them. You want to catch them off guard, and sometimes you want to scare them, like “Oh my God, Frank (Tobias Menzies) is going up that hill! If he goes through time, I’m out of the show!” It’s great. I am sitting here watching and going, “Across America, people are losing their minds!” And that’s fantastic, and I enjoy that. Outlander TV News: The teaser where it was really Claire’s dream and she tells Mrs. Fitz (Annette Badland) . . . people were losing it. Ron: I know. And that is…fans of the books also have discovery. They should also be surprised. You want to engage their emotions as well. But then there is the other half of the audience that has no idea what the books are about and you have to tell them the story clearly. They have to be able to follow along. I always make the comparison to Game of Thrones that I have never read those books, so that TV show has to stand on its own. It has to work for me and it does not matter whether that scene was in the book or not. If I don’t get it, I’m not engaged anymore, so we are always trying to keep both elements of the audience in mind. Outlander TV News: Since Tobias (Menzies, who plays both Frank and Jack Randall) is not here, I wanted to ask how Tobias and Laurence (Dobiesz , who plays Jack’s brother, Alex Randall) are getting along. Is Laurence trying to mimic some of Tobias’ mannerisms at all because he is playing his brother? Ron: No, I don’t think he is actually. We shot some scenes with him and no. I think we have kind of stayed away from that. I mean, in the book, they are so close together that they/she literally mistakes him for Jack when she first sees him. Outlander TV News: He (Laurence) looks remarkably similar . . .
Ron: He looks pretty close, but I did not want to play that gag twice. There was no way. Tobias was never going to Alex as well. It was one bridge too far for us. He (Laurence) is not trying to pick up any ticks or anything. Q: Tease some of the new characters we are going to meet this season for those who are not familiar with the books. Ron: There are actually several historical figures that are in the books for the first time. We are going to meet King Louis XV. The Count de St. Germain is a real historical character who is one of the villains in the show. There is a gentleman named Master Raymond who runs an apothecary shop in Paris that becomes a confidant of Claire, and he’s got some mystical, interesting things going on in his world. There is Mother Hildegard who is a nun who runs a hospital in Paris. She is a key player in the show. She has a dog, Bouton, which the fans are…(looking at us), right? Trust me, Bouton is in the show. There is a boy named Fergus that becomes very important, especially in the book series as it goes forward. He is introduced this year. Bonnie Prince Charlie who we meet this year, a real historical figure again. I am sure I am missing somebody, but those are the key players, I think, in terms of new characters. Louise de la Tour (Ron said the actress who plays Mother Hildegarde, but he meant to say Louise de Rohan) is a friend of Claire’s in Paris who plays an important role. Jared, Jamie’s cousin, is also a character. Q: Scotland is such a major part, obviously, of the first season. The culture and everything almost became a character in and of itself. For the first half of the second season, which takes place in France, did you guys try to mimic that sensation at all? With Claire and Jamie there is so much discovery and wonderment for them and the audience. Ron: Yeah. We are plunging them into another world. There were no costumes, sets, or props we could use. We had to create a new series for the second season, so for the audience, it will be just like, “Wow. This is Outlander?” I mean, we won’t have any of those elements in it, other than the three characters that came over. Everyone else is left behind. It’s a whole new world and a whole new story. Eventually, it does get back to Scotland, so we will regain a lot of that stuff from season one. It’s a whole new deal. The rhythm of the scenes is different. The way it is shot is different. Fabrics are different. The color palettes are different. I mean even the most basic candles…the heavy, big candles in Castle Leoch are now fine, tapered candelabras. There is a lot of gilt and fine china and silver. It’s just a completely different world. Ron: Their story in season two is that they are trying to change history, so that’s a pretty big deal. Her knowledge of the future, helping to inform them to figure out a way to stop the Jacobite rebellion, stop the disaster at Culloden is kind of the mission statement for season two. There is not a lot of time travel, like season one, in the show, but it is still a key idea that it still propels a lot of the action in terms of what people are doing. Q: Does Claire think about her future, that it may be gone if she does change it? Ron: A little bit. You know it’s tricky. We are trying to not put too much of the…we never call them different timelines. We never try to get too far into the science fiction aspect of it. We try to play enough of it, so that the concept is clear to the audience. There are definitely some things she worries about that could be changed by her actions in the past, but we try not to get too bogged down into the butterfly effect of this or that because God knows by now the future is taken over by Nazis as far as she knows. Ron: Definitely. Another three would have helped, but that’s the gig. It’s still more episodes than Starz typically shows, so I am fine with them. I knew going in there was going to be 13. Fortunately, it is the thinnest of the books. It’s not like the next one (Voyager). The third book is a whole different animal. Q: Is there talk of splitting (Voyager) into two seasons? Ron: We talk about it, but we haven’t…no decision has been made. I haven’t really focused on it yet. I don’t have a third season pickup, so I don’t have that problem yet. Eventually, we will have to have that discussion. I don’t know what the answer is. Maybe, maybe not. We’ve always talked about doing a book a season, but there are books that are just big and complicated, but once you do that…Okay, are we ever going to get to book eight or nine? You just start thinking about how many years we are talking about and I don’t know. I really don’t know the answer to that yet. Outlander Podcast: Season one was split into two and the key art was definitively and decidedly different. The blue, kind of glowing, beautiful hues of Scotland to the grittier, darker, more dangerous second half. In season two, the first half is in Paris, or at least the first part, and then they return to Scotland. Has the look been decided? Outlander Podcast: The key art or the tone? Obviously if you read the book, you know what happens, but as far as the look you want to give it. Is it the same Scotland or the one she came to? Ron: The Scotland will be a war-torn Scotland, so it will be a heavier, darker, more threatening environment when the story gets back to Scotland. But the Parisian part is much richer and much more romantic. It is a different world and we play that, so visually, it is shot different. It has a different kind of mood and feeling to it. We have not done the key art campaign yet. Three if By Space: The Emmy nominations will be coming up soon. Starz made a big push to have fans tweet out and push for Emmy nominations. Your wife (Terry Dresbach, costume designer) has made no secret of the fact that she does not care for this, that she does think Emmys mean a lot. What do you think awards mean to the show or to your career? Ron: What it means to me is that I would like to go back to Scotland and say, “You know what? Your work matters. Those people back at the TV Academy recognized you and they are your peers.” I think it matters. I like those people in all those different departments and the cast…these people work very, very hard. They work harder than I do, trust me. They are out lugging cameras around in the dead of the night in the goddamn snow. That’s tough. So, to be able to go back and say, “Hey, here is some goal or recognition.” I think it matters to the morale of the show. I think it matters that people be acknowledged. If you don’t get it, okay, that’s fine. (Battlestar Galactica) was ignored year after year after year. We were still very proud of it, and we were still like, “Screw the world!” You know you are doing a great show and we really felt that way. But it was always really annoying to me that Edward James Olmos never got a nomination. He is one of those great actors and did fantastic work and I could not believe year after year, he was ignored. So those things are kind of frustrating. I don’t think Terry cares one way or another, but I want them to recognize her work. I think she has done fabulous work and same goes for the cast and same goes for the cinematographers and on and on and on. I think all these people do really good stuff and it would be nice to have recognition. This entry was posted in Annette Badland, Caitriona Balfe, Diana Gabaldon, Interviews, Laurence Dobiesz, Ronald D. Moore, Sam Heughan, Terry Dresbach, Tobias Menzies and tagged Annette Badland, Caitriona Balfe, Diana Gabaldon, Dragonfly in Amber, Interviews, Laurence Dobiesz, Ronald D. Moore, Sam Heughan, SDCC, Terry Dresbach, Tobias Menzies, Voyager by Sarah Ksiazek. Bookmark the permalink.